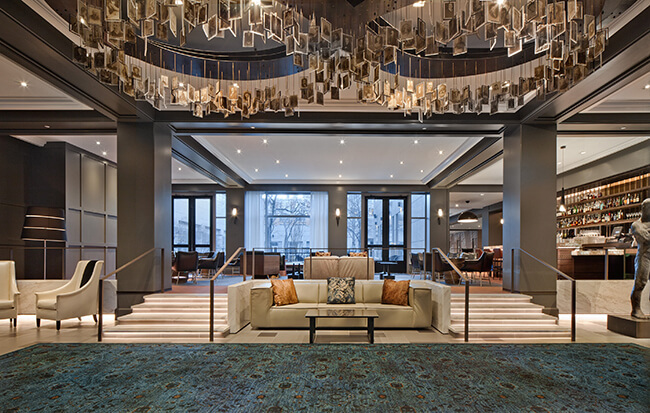 Philadelphia’s newest hotel, The Logan Philadelphia, opened in December following a multi-million dollar renovation. With 391 inviting, sophisticated guest rooms — as well as spacious suites complete with marble floors and French doors — The Logan Philadelphia, Curio Collection by Hilton offers guests a luxury experience combined with unparalleled design. Situated on the edge of the Benjamin Franklin Parkway, in the heart of the museum and business district, the hotel’s prime location in Logan Square offers an enticing mix of history, culture and commerce. Additionally, numerous green spaces within the hotel grounds and just steps from the hotel — including the square that gives the area its name — provide serene spots for relaxation and reflection. In addition to luxury accommodations, The Logan Philadelphia is also a culinary destination in itself. Located adjacent to the hotel is Urban Farmer Philadelphia, a unique steakhouse concept by restaurateur Peter Karpinski, Co-Founder and COO of Denver-based Sage Restaurant Group. The Commons Lounge, located in the lobby, offers a comfortable, yet stylish place to sip a cocktail, socialize and enjoy small plates from 3 p.m. to midnight daily. Assembly, the hotel’s rooftop lounge, will open in spring 2016 offering unrivaled views of Philadelphia’s Museum District. Each of these outlets will provide outdoor seating options either on the rooftop or street level, showcasing amazing views of Logan Square. The guest rooms, event space and public areas of The Logan Philadelphia will feature locally curated art. With a collection comparable to a gallery, the hotel will showcase statues, paintings, murals and sculptures true to the Philadelphia scene. For those seeking a memorable event, The Logan Philadelphia offers 12,700 sq. ft. of flexible indoor and outdoor meeting and banquet space — including a grand ballroom that can accommodate up to 500 guests. The hotel also offers 12 modern, highly adaptable meeting and event spaces ranging from rooftop venues to sunlit boardrooms. Customized on-site catering and state-of-the-art audio/visual equipment will ensure every event — large or small — is a memorable success. Click for our new searchable venues feature.